John Street was born on the 13th of May in 1837 at Cornersville, Tennessee. He attended school there before moving to Paris, Texas in 1854. Street studied at the McKenzie College in Clarksville. There, J.W.P. McKenzie was called “Old Master” and ran his school with an iron fist, demanding punctuality and seriousness in the school. Only the best students made it and Street graduated among a select few. In Paris, Street was made principal of the Paris Female Seminary as he had been a successful Methodist preacher and teacher there already in the 1850s. 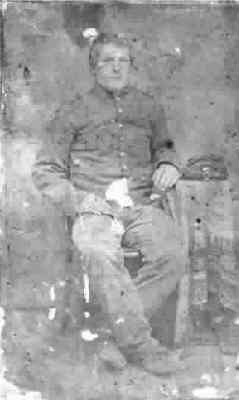 When the Civil War broke out, he enlisted under General S.B. Maxey. He immediately began to write love letters home to his wife. Aside from expressing his devotion to her, he detailed the conditions of the war, personalities of his fellow soldiers, and some of the major events that he witnessed at the battles of Murfreesboro and Vicksburg. His letters are preserved at the University of North Carolina at Chapel Hill. Author Julie Coley has recently published a book containing some of his letters. After Street received several promotions to as high as the rank of major, the war ended. In 1865, Steet moved to Waco where he taught a private school for a few years. He left Waco to live in Cherokee county for three years but came back and began to publish “Street’s Weekly,” a newspaper covering local events. He continued this paper until he sold it in 1903 and its name was changed to Holland’s Magazine. It then continued being published until 1953 when it was closed but not before playing a major role in improving the quality of food produced by major manufacturers. Street worked as an editor for several other publications such as the Waco Reporter which he sold in 1875, Texas Resources, the Texas Intelligencer, and the very popular fraternal paper the Texas Odd Fellow. He owned the Waco Daily Examiner during the 1880s. In the 1880s, Street changed chuch affiliation from Methodist to Universalist and helped to form the first Texas convention of Universalists for which he served as secretary at conferences over several years. 1881 saw Street and Joseph Speight travel to Houston for the Grand Masonic Communication of the Most Worshipful Grand Lodge of Texas. In 1889, Street was pitching hay and in a freak accident, he injured himself with the pitchfork. This resulted in him using a cane to walk for the rest of his life. Street was the editor of the “Masonic Light” magazine based in Dallas until his death. In an effort to make the popular magazine interesting, he traveled across Texas and neighboring states to visit various lodges and brethren for new articles. When he died, he was in the midst of running for Congress. He died at the home of his friend William Poage, an early Waco cowboy and rancher who was the father of Congressman Bob Poage. Street was buried alongside so many other Waco 92 men and area pioneers in First Street Cemetery. “It was fitting, we think, that J.K. Street should pass from earthly life here in Waco where he commenced his career of unremitting, really wonderful activity, and where he did achieve much good for society and usefulness to those he loved. In May of 1871, Brother E.P. Massey was having supper at his home with his family and two guests, Brothers B.F. Richey and Harvey Mitchell. Massey and Richey were members of Waco 92 and Mitchell had been the first worshipful master of Brazos Union Lodge in 1853. However, the bond between these men existed long before their initiations into freemasonry. All three of them had been born and raised in the Cornersville area of Tennessee and attended school together. As they dined and talked about old times, they began to name others who had come to Texas from the same region. An idea came forth that they ought to organize a new social club consisting solely of fellow Cornersville Texans and so the Cornersville Club was born. At its first meeting one month later, nine members met for a “traditional Tennessee” meal and festivities. Seven of them were Richeys and Mitchells, but two were not. E.P. Massey and Dr. W.H. Wilkes rounded out that initial group of nine. In the months that followed, others were added to the membership such as J.K Street. Their numbers quickly swelled to more than fifty with most living in Waco or Bryan and one as far away as Galveston. A new tradition was agreed upon. While mini-meetings would regularly take place, there would be a large annual celebration held at the home of the club’s oldest member who had not yet hosted. As part of the joining process, every member was required to give the Club a fine bottle of wine with his name on it. From then on, if any member should have passed away since the prior annual meeting, the Club would open the deceased companion’s bottle and drink it in silence to his honor. Also in that first meeting, one special bottle of wine was signed by all the members and stored away with the rule being that some day, the last surviving member would be required to drink it by himself along with his own bottle on the typical anniversary meeting day. Annual meetings were held on the Fourth of July and families usually got involved in the fun. In 1874, just three years after the dinner conversation that started the whole concept, word had traveled back home to Cornersvile, Tennessee and at the annual club meeting, an invite was read from the citizens of Cornersville suggesting that the club hold its next meeting in their hometown. When the next meeting rolled around, the members traveled up to Tennessee and there was a big cookout and celebration held at the Beech Grove Seminary where they had all gone to school together in their early years. The entire town of Cornersville got involved and it was estimated that more than 8,000 people total showed up to celebrate the club’s spirit. Dozens of men and women who had long since left the community hoping to build legacies in the wild and unpredictable state of Texas were come together for the first time since they were boys and girls chasing each other around the same school grounds where they were now being celebrated as heroes by thousands of Cornersville residents. In Texas, they had become judges, bankers, merchants, doctors, and farmers but back in Cornersville, they were simply schoolyard friends. The Cornersville Club continued meeting through the years and many bottles of wine were drunk in silence. More trips were made to Cornersville and various parts of Texas where the members had built lives. By 1895, only six members remained, Massey included, and they continued meeting and celebrating old memories. That year, the reunion was held at Massey’s home in Waco. He died less than a year later. After that, meetings were scarce. The few remaining members had become old and distance was a problem. In 1899, the last official meeting took place in Bryan and only three of the five living members were able to make it. They entrusted the Brazos County office with the archives and belongings of the Club and agreed that it was unlikely another meeting could take place. The County stored the wine and archives in its vault but during several moves over a period of about 15 years, all but the wine was lost. Finally, in 1914, the last remaining Cornersville Club member was Brother J.K. Street. At seventy-seven years of age, he made the trip from Waco to Bryan with the intent of keeping the promise made some forty years prior. County officials escorted him to the vault and handed over the remaining bottles of wine. That night, he returned to Waco and probably after having consumed a good bit of wine, J.K. Street passed away in his sleep at the home of friend, William Poage. So ends the story of the Cornersville Club.